Some years ago I was looking for a new way to prepare turkey. I explored many recipes and I finally found one that convinced me. 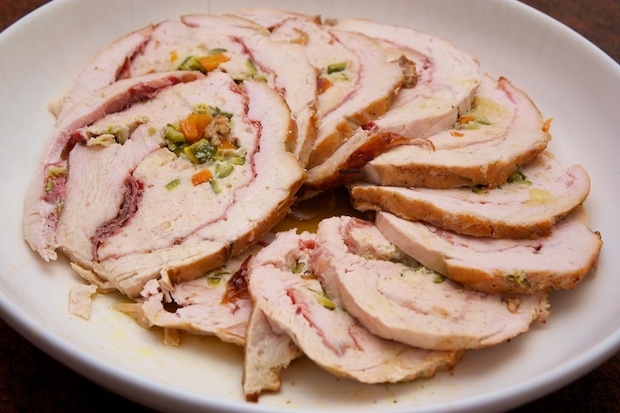 In the original recipe, the turkey roll is baked in two stages. The first stage includes a turkey roll that is browned and pulled off the stove half cooked, then wrapped in puff pastry and baked in the oven. This method is very dramatic because with the scraps of pastry you can make nice decorations to apply to the roll. Over time, I decided on an easier formula without the puff pastry. This recipe requires an elaborate preparation, but if you follow the steps outlined, it won’t be difficult to achieve a good result. 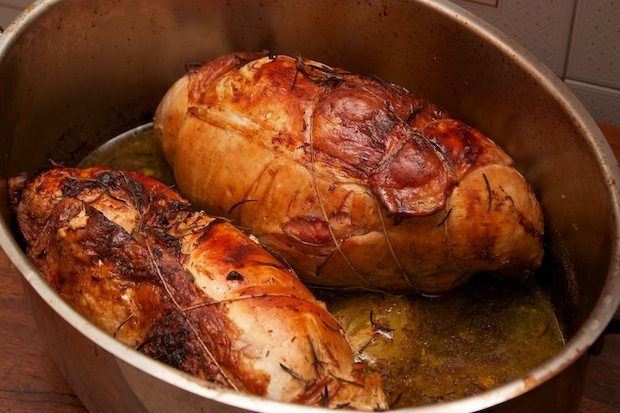 The roast can be prepared and cooked the day before its consummation. Slice it just before heating it. Baste it with its cooking liquid, cover the pan with aluminum foil, and place it over a pot of boiling water (water bath). Bring to the table when it is hot and serve immediately. Keep in mind that the time it takes to bring the meat to the right temperature is about 45 minutes. Therefore carefully calculate the time, so that it is ready for lunch at the right time and not too dry. 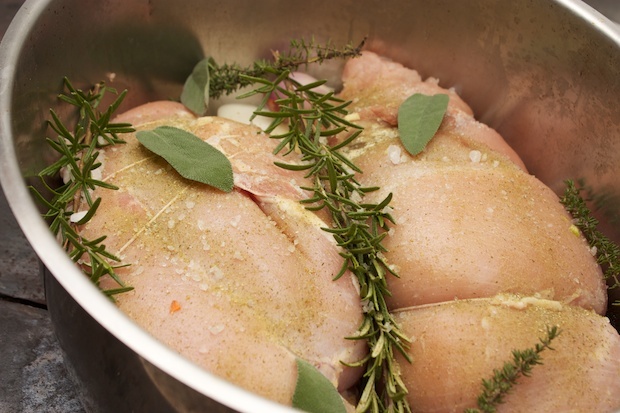 If you are afraid to try this, you can always resort to the recipe for turkey thighs or sliced turkey with pomegranate (you will find in the recipes for next week) very simple and effective. The portions that I recommend are good for 10 to 12 people. If you have leftovers, you can cut them thinly and freeze them. They can be used for sandwiches or sandwich with lettuce and tomato or other delicacies that your family enjoys. Prepare the table: a cutting board, a cloth, twine, a needle and thread for basting, a pan, a pan that can go in the oven, a meat pounder, a blender and all the ingredients. Add the stale bread roll into a bowl with milk and soak. Thinly slice the leek and dice the carrot and the green of the zucchini. In the pan, add a spoonful of olive oil and the chopped ingredients. Sauté for 5 minutes then turn off the burner. 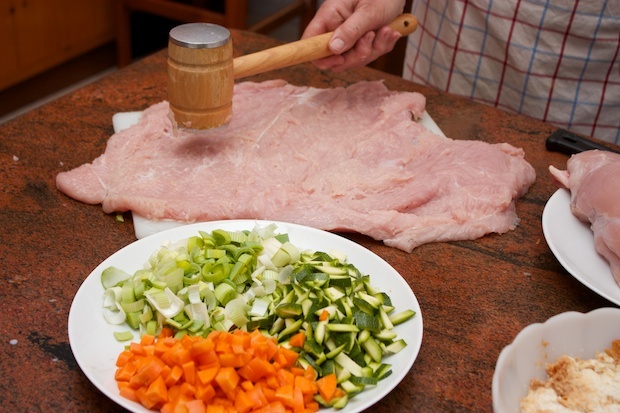 Place the breast on a cutting board and remove the piece of thread that is underneath. Cut the meat along its length as if opening a book. 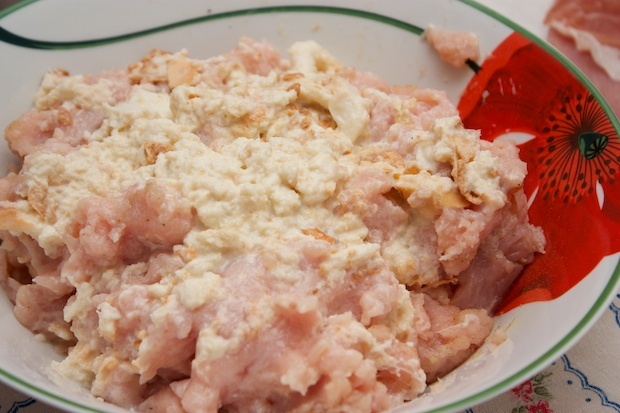 Remove the points where it is a little thicker meat using a sharp knife and tear it to pieces. Cut the fillet into small pieces and also reduce it. Add the mixture into a blender along with the bun soaked and wrung out, egg white, a little salt and pepper. Whisk all at low speed. 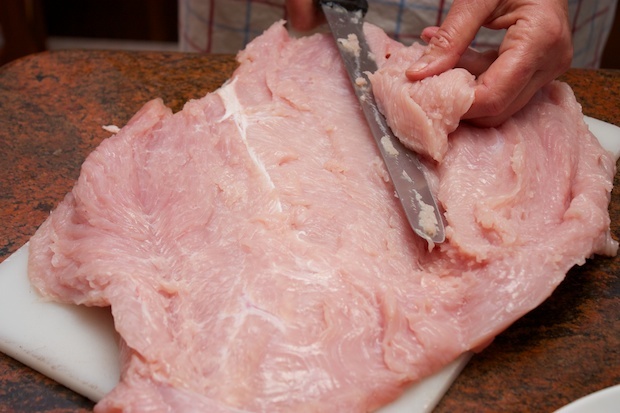 Beat the breast with a meat mallet to thin out the thickness, making it easier to prepare the roll. Place the meat on a kitchen towel (this will help shape the roll). 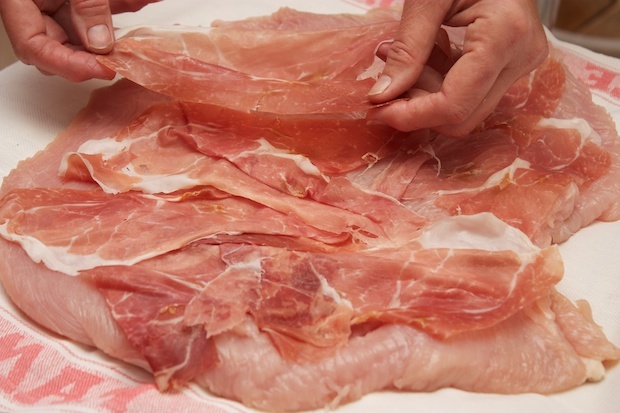 Place a layer of prosciutto on the breast. 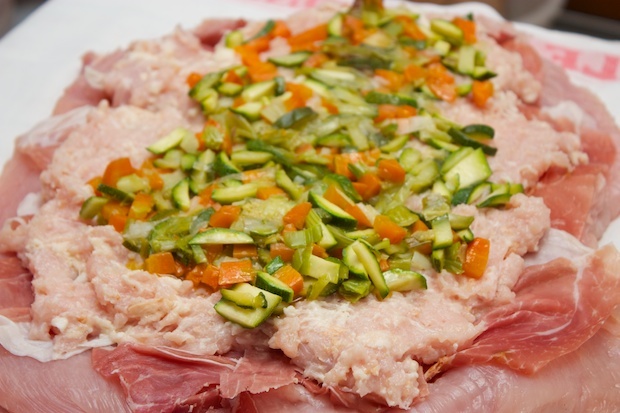 Spread the meat and on top, spread out the pureed vegetables. Roll the meat with the help of the kitchen towel. With string, tie the ligature loosely. At the points where the filling tends to go out, sew the edges of the meat with a needle and thread. In large saucepan, add the olive oil, herbs, garlic and shallots. Place the roll in the saucepan and turn on the burner. Season with salt and pepper. Sauté for 10 minutes per side, pour in the wine and let evaporate. Add a ladleful of hot broth. Cover with baking paper and bake. Lower the oven to 400°F. After 30 minutes, stir the roast, remove the paper and cook for another 30 minutes, turn it over, add a ladle of hot broth. Continue cooking for another 60 minutes stirring at least twice. Remove from oven and let cool and cut into thick slices. Drizzle with the sauce (ideally filtering) and serve.